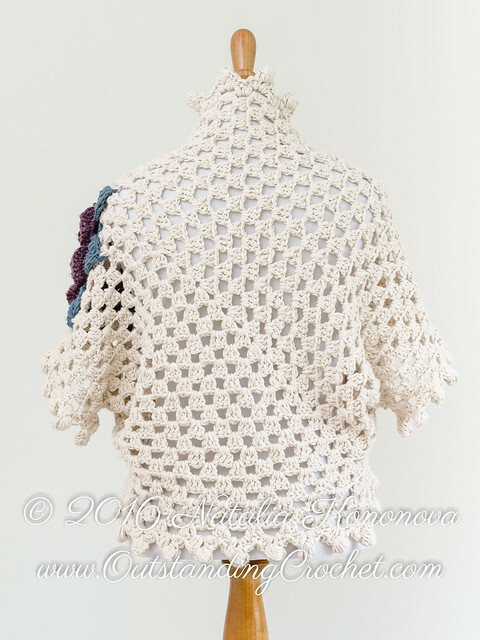 Outstanding Crochet: New Crochet Bolero Shrug Pattern in my shops. New Crochet Bolero Shrug Pattern in my shops. Enjoy the pattern! As always, charts, schematics, step-by-step pictures and instructions. See full description bellow pictures. Sizes: - S (M, L, 1X, 2X, 3X) / 34 (38, 42, 46, 50, 54)'' / 86 (96, 106, 117, 127, 137) cm in bust circumference. 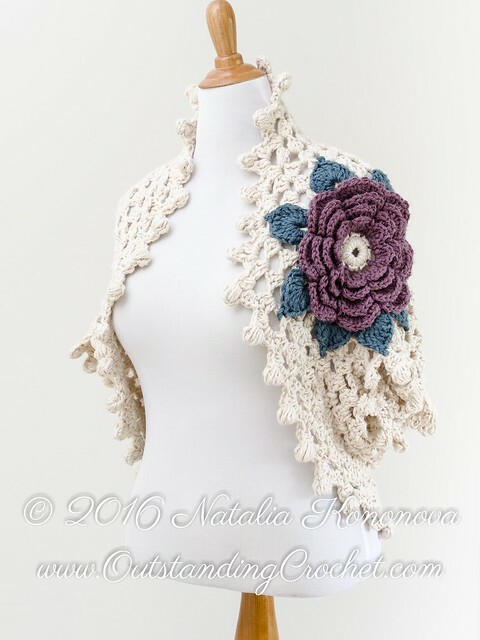 Romantic Lady Crochet Bolero Shrug Cardigan Pattern with Big Flower Motif - Open Front - Bridal Bolero shrug. Made with bulky weight yarn, this is a fast project to complete. Perfect gift. Sizes S, M, L, 1X, 2X, 3X. File includes a few charts, instructions and step-by-step pictures! Beginners - this is an opportunity to level up! - I / 9 / 5.5 mm. 2. The items cannot be mass-produced. 3. Items must be made only by the buyer. 4. Give credentials to Natalia Kononova at www.OutstandingCrochet.com as the pattern designer on a tag affixed to each item and in the listing if selling on-line. 5. You may make alterations to the pattern, but you must still link to the original pattern and credit Natalia Kononova at www.OutstandingCrochet.com on the item’s tags and listings. - Purchasing the patterns does not remove the copyright protection of that pattern but gives you only the right to make items from it. - Do not copy, share, resell, or forward this pattern to anyone. No part of this work may be reproduced, transmitted, translated or published in any form or by any means without prior written permission. BELLISIMO!!! qué hermosas creaciones, Cariños a la distancia,,,, desde Argentina. Очень красиво. И цвет экрю я очень люблю. Спасибо, Эльвира! Согласна, он очень благородный.